Band activity fees were due on 10/15/13. MHS is giving us a two-week extension before sending late notices. Fees are $20, made payable to Moody High School. Dr. Sargent will issue receipts. Thanks. Cheesecake sale fundraiser brochures and order forms have been distributed to every band and auxiliary student. Parents, please help your student handle this form and make sales to friends, family, and associates. Checks should be made payable to the Moody Band Boosters and returned with the order form by October 28th to Dr. Sargent. After expenses, students get 100% of all funds raised placed into individual band accounts for help on band trips, band fees, etc. For every 15 items sold, your student may choose one item from the brochure, free of charge. For every 25 items sold, your student is entered into a drawing to receive a pizza party for the whole family. Spring trip deposit dates will be posted soon. Get a head start on fundraising! Thank you! The registration will be open until Friday, November 14. Polo shirts are in. Every band student should have one to use for a concert uniform and for other occasions. If you have not received one, please see Dr. Sargent. $20 each, payable to the Moody Band Boosters. Thanks. The $20 per semester band activity fee is due today. Please make checks payable to Moody High School and bring to the band room. Dr. Sargent will issue receipts. Thank you! If you have not yet donated your 2 cases of bottled water to our band program for the season, please do so at your earliest convenience. We have run out of cases and have 4 games remaining, including playoffs on Nov. 8. Cases can be delivered to the band room and placed in the band library. Thank you! Many positive comments were received on our bowling outing last Saturday. It allowed a good chance to get out of the heat of the Pinson stadium for a while and enjoy our time together as a band. Please remember to bring $7.00 to help the band boosters cover the cost of that event. Thank you! A volunteer is needed to pick up a pizza order from Little Caesar's this Friday at 3:00 pm or slightly earlier and deliver to the band room by 3:15. RSVP to Dr. Sargent at brad.sargent@sccboe.org or 640-1995 if you're able and willing to help. Thanks. • This is a Moody band event and is an approved MHS field trip. No visitors, no passes out. • MHS at Curry on Friday, 10/18. Band remains after school, supper provided. Depart 4:00 pm. Return to band room by 12:00 midnight. Have rides ready. 9:00 am call time, band room, breakfast available. Special diet? Bring your own or eat before you come. Stay posted for more details. 8th Grade Band members perform side-by-side with the MHS marching band this Friday, 10/11/13, at the MHS vs. Springville football game, Bill Morris stadium. Call time: 5:30 pm, band room. Uniform: Moody Band polo shirt (distributed this week). Parents may stay and enjoy the performance (highly recommended--$5.00 admission fee is charged at the gate), help in our concessions (much needed and waives admission fee if Dr. Sargent is notified in advance), or parents may pick up students at the band room by 10:30 pm. All 8th grade band members are invited and strongly encouraged to attend this event and to be recognized at the half time performance. A letter will go home this week detailing the event, in addition to a medical release form which must be signed and returned by Friday in order for your student to participate. Cheesecake Sale: to benefit all band members. A high percentage of the sale goes to individual band booster accounts and can be used to pay band fees, spring trip payments, or any other large expenditures related to band. Sale begins October 15th. Cheesecakes will be delivered the week before Thanksgiving. Help is needed to package items in the band room on November 18th. Please RSVP to Dr. Sargent if you can help! MJHS Beginner and Intermediate Bands In-School Concert November 7th (rescheduled from 10/31). This is a chance for parents and other family members to see a typical band class in action. Beginning band meets 8:45-9:45. Intermediate band meets 9:45-10:45. Refreshments served. All visitors must sign in at the MJHS office before entering the band room. 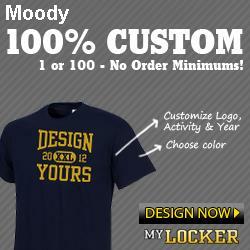 Moody Band Boosters: Our sole source of funding for our band program. Meets in the band room the third Tuesday of every month at 6:30 pm. Please join us! Moody Bands Christmas Concert, December 12th, 6:30 pm, MHS Gym. All members of the Moody band program: beginning, intermediate, and concert bands, perform a holiday concert for our community. Donations of new, unwrapped toys for the Moody Fire Department's toy drive and non-perishable food items for Shepherd's Supply are accepted at the door. If you haven't done so already, please sign up to receive Remind 101 messages. In addition, more extensive information can be found on our website below and by joining the Moody Blue Devils Group (see the link on our website). Thank you for granting me the privilege of teaching your students the joy of music-making. I look forward to your involvement in our growing band program. Please contact me if you have any questions or if I can help you or your bands in any way. 10 am call time at band room-- Chic-fil-A provides biscuits. There's no time to eat as a group again until after our 1:40 performance. Sending your student with a non-perishable, quick snack is a good idea. 1:40 performance; change out of uniforms into street clothes. Weather could get cool or rainy or stay warm, so bringing clothes for a variety of conditions is a good idea. 2:00-- go to a local park for the afternoon. Parent chaperones, director, staff, and band students only. No outside visitors (No boyfriends/girlfriends who are not current band members). Band boosters are cooking hamburgers for late lunch/early dinner. 5:00-- back to contest stadium to view other bands. Students can go to concessions and vendors in chaperoned groups, so extra spending money is a good idea. Parents: If my own child were on this trip, I would make sure he had a change of appropriate (depending upon the weather and SCCBOE dress codes) street clothes with a sweatshirt or light jacket, tennis shoes, a few relatively healthy and non-perishable snacks, extra spending money for vendors and concessions, a well-maintained instrument and equipment, band t-shirt, under-armor shorts, long black socks, marching shoes, and maybe a frisbee, book, or game for supervised free time at the park in Oneonta, in addition to a current (less than one year old) medical release form on file with Dr. Sargent. No sports drinks, soft drinks, or energy drinks, please. Water only. Awards acceptance team= student officers, captains, and section leaders, regardless of class standing. All students must remain with the band at all times. No passes out of the event.